A remarkable desigh with names of popes, emperors and kings meandering throughout the text. The Fasciculus Temporum is a beautifully illustrated chronicle of the history of the world, presenting both temporal and church history since the Creation. It is a translation of the Latin chronicle of the same title, written by the learned Carthusian Werner Rolevinck from Cologne (1425-1502). The Latin Fasciculus appeared in two competing editions with the printers/publishers Arnold Ther Hoernen and Nikolaus Goetz von Schlettstadt. Ther Hoernen was in close contact with Rolevinck, of whom he published several other works. It was on Ther Hoernen’s edition that the Louvain printer Johan Veldener based the next Latin edition in 1475. Five years later Veldener, then working in Utrecht , produced the earliest edition of the text in the Dutch vernacular. Later, translations into French and German would be published. Before 1500 over thirty editions were published all over Europe. When opening Veldener’s Fasciculus Temporum, the remarkable design is striking. The main text contains the continuing story of the history of the world. The text is surrounded by two separate timetables (one from the Creation onwards – anno mundi – and one related to the birth of Christ). Above and beneath these timetables there are blocks with separate information. Names of popes, emperors and kings are meandering throughout the text in larger and smaller circles, some linked together, some not. What makes this way of presenting special, is that it offers the reader the possibility to read the history either synchronically or diachronically. In the Dutch version of the Fasciculus Temporum Veldener used his woodcuts of the Latin edition of 1475, but he also ordered eight new illustrations. Equally striking is what happens on the textual level. For the new edition of the Fasciculusi (f. 1r-193r), he had a large series of short chronicles made and lists of names (f. 194r-329v) of the kings of France and England, the dukes of Brabant, de bishops of Utrecht, Cologne and Liege, the counts of Holland, Gueldres, Cleves, Mark and Berg. In the presentation we recognize the hand of Veldener: it follows in close harmony the special lay-out of the Fasciculus. 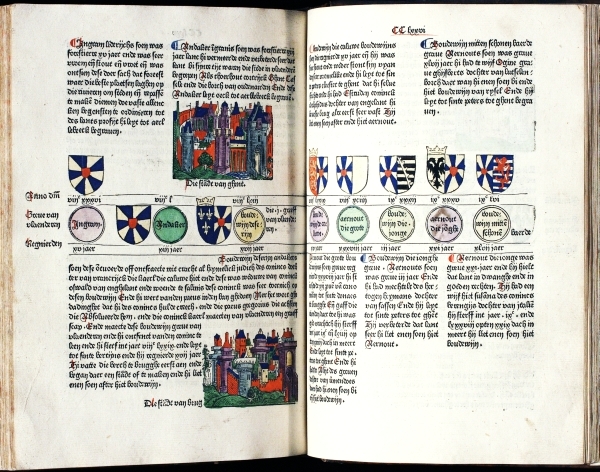 In many cases the added chronicles are illustrated with series of heraldic coats of arms. The Fasciculus Temporum and the new chronicles do not contain important new historical facts, but the content of the compilations offers a compelling insight into Veldener’s geographical horizon. Leiden University Library possesses seven incunabula of the Fasciculus Temporum (including the copy in the Bibliotheca Thysiana); among these one with the Middle Dutch text. To honour Wim Blockmans on the occasion of his retirement as professor of medieval history, Leiden University Library has digitized the last-mentioned, coloured copy (1369 C 11). This fascinating text is now readily accessible for investigation by linguists, historians and art historians. Blog post by Wim van Anrooij, professor of Dutch literature, and Robert Stein, lecturer in medieval history, at Leiden University.